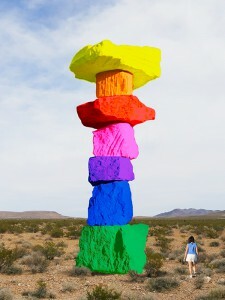 Art Production Fund and the Nevada Museum of Art are pleased to announce Ugo Rondinone’s Seven Magic Mountains, a large-scale public artwork in the desert outside of Las Vegas, slated for early 2016. Located a short distance from Nevada’s legendary Jean Dry Lake where Jean Tinguely and Michael Heizer created significant earthworks, Seven Magic Mountains is the first earthwork completed in over 40 years, and pays homage to the history of land art. Art Production Fund (APF) is a 501(c)(3) nonprofit organization dedicated to commissioning and producing ambitious public art projects, reaching new audiences and expanding awareness through contemporary art. The Nevada Museum of Art is a museum of ideas. The only accredited art museum in the state of Nevada, it is a private, non-profit organization supported by the generosity of its membership as well as by sponsorships and grants. Through creative programming and scholarship, the Museum provides the opportunity for people to encounter, engage and enjoy a diversity of art experiences.